Stewart Island Flights flies regular daily flights in twin engine Britten Norman Islander and Cessna aircraft between Invercargill Airport and Stewart Island. 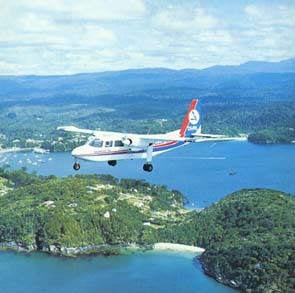 Stewart Island Flights has developed an efficient air link to Stewart Island to serve the needs of tourists by scheduling flights for the day tripper and those who elect to overnight on Stewart Island. Stewart Island Flights provides an effective, quick, comfortable and relatively inexpensive method of travel to visit New Zealand's third largest Island. The Airline has operated in a very consistent manner throughout the years of service providing a reliable link to Stewart Island. Flight time is 20 minutes. Cancellation more than 48 hours prior to departure time will incur a cancellation fee of 20% of the fare. Cancellation within 48 hours of departure will incur forfeiture of the full fare. Application for refund will be assessed on a case by case basis. Baggage is limited to 15kgs per person. Excess baggage rates apply.